Riders, trainers, owners and other team members come to New Albany from a myriad of locations, including Beezie and John Madden of Cazenovia, New York. Beezie is the highest ranked U.S. female rider in the world and an individual and team Olympic medal winner. Given the heavy emphasis on those causes, not to mention the long reach both events have, it might be easy to overlook the positive effects visited on the New Albany community. But make no mistake: The New Albany Classic Grand Prix & Family Day and the New Albany Walking Classic pay big dividends for local businesses as well. More than 25,000 people are part of the two events, says New Albany Public Information Officer Scott McAfee, and their draws are substantial. The Classics also serve to draw eyeballs to New Albany. Improving the city’s standing in the eyes of the world has its advantages, too. “People coming to New Albany for those showcase events can only strengthen people’s perceptions of how great New Albany is as a community,” says McAfee. Real estate agents often hold open houses the weekends of major events, Nelson says. The city works closely with the organizers of both events through its Event Logistics Committee, ensuring residents are aware of them – as well as other major goings-on in New Albany – and are prepared for temporary changes in traffic patterns. The Concert at The Classic presented by Justice draws music fans from throughout the region to the event to hear the hottest pop acts. outside the central Ohio region, including Pennsylvania, Indiana, Michigan, Kentucky and other parts of Ohio. “The Classic parks approximately 3,500 to 4,000 cars on event day,” says Stephanie Lorenz, event director for the Classic. Per statistics from the Greater Columbus Sports Commission, those out-of-towners spend over $1 million during the weekend. Restaurants, coffee shops and grocery stores are among the most-visited area businesses, says Lorenz. “You wouldn’t be at all surprised to see a group of people in riding attire lined up at Starbucks (in) Market Square at any time that weekend,” Lorenz says. Hotels also do big business. Among owners, riders, grooms and event attendees, hotels in and around New Albany put up 160 rooms. Also benefiting from the Classic are the arts and athletic organizations that provide activities and entertainment – and, in so doing, are exposed to a wide audience. Columbus Children’s Theatre and Royal Arts Fencing Academy have participated in years past and will be back this year. BalletMet will be on hand for the first time this year. A number of businesses – from Bungalow Home and Doran’s Farm Market to Subway and Giant Eagle – contribute goods and services to the Classic, and, in turn, are celebrated through materials including digital boards and T-shirts during the event. “These businesses are making a commitment to ending family violence by supporting the Classic and the Center for Family Safety and Healing, so we make sure the thousands of guests in attendance know that so they can patronize those companies,” Lorenz says. The event has also seen 4,400 volunteers contribute about 27,000 hours of time since its inception, and earned more than $1.5 million worth of earned media coverage in 2013 and 2014, including national publications. The Walking Classic draws participants from 40 states and Canada. status as the biggest walking-only event in the U.S. The Walk, which capped entrants at 4,000 this year, brings in participants from approximately 40 states and Canada. Those outsiders are already in a position to patronize local businesses, but Walk organizers sweeten the deal, nudging attendees toward such spots as Mellow Mushroom, Rusty Bucket and Ella. “We partner with all of our local restaurants, so often, (participants) get coupons in their race packets the week before,” says Kristin Ferguson, marketing director for the Walk. Though the Classics are two of the city’s best-known events, other items on its annual agenda serve to bring in outsiders and revenue as well. Among them is Pelotonia, which, while not limited to New Albany, does make an important stop there and even ends there for those brave souls who undertake the longest route possible. our community and seeing just how wonderful it is, but all three events give so much back to central Ohio and New Albany,” McAfee says. 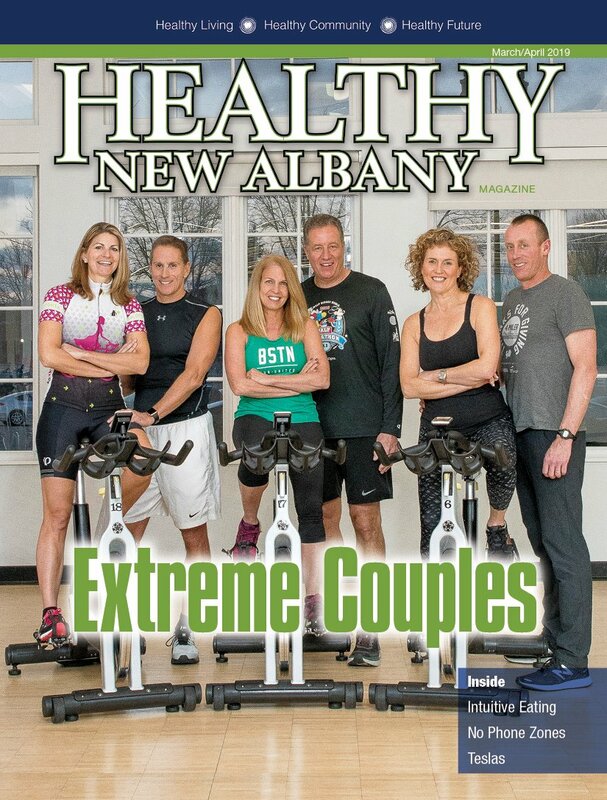 That give-back includes the money Pelotonia raises for cancer research, the Classic raises for the Center for Family Safety and Healing and the Walking Classic raises for services, particularly those at the Philip Heit Center for New Albany, that make New Albany a healthier community. Pelotonia takes place in August, as does another local event that has an effect on the city’s economy: the Taste of New Albany, organized by the chamber. “The city and the chamber use the Taste of New Albany to invite and entertain prospective businesses that might be considering opening (in) or relocating to New Albany,” says Nelson. Nelson also points to Pelotonia and Ride 2 Recovery’s Honor Ride, which took place for the first time this past May, as events that attract attention to the city and its companies. Garth Bishop is managing editor. Feedback welcome at ssole@cityscenemediagroup.com.